Time again for Baby Quilt Friday–a look at the stories and sentiments behind my quilts from The Little Box of Baby Quilts. Out of the 20 quilts in the "little box," this is certainly one of my favorites. And the making of this quilt all started with a trip to the grocery store. 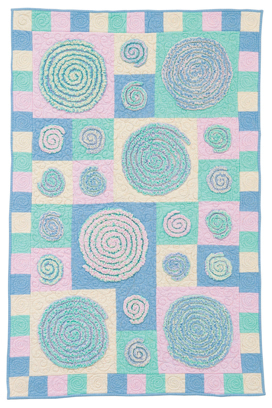 "Buttermint Swirls" from The Little Box of Baby Quilts, copyright 2007 Jenny Wilding Cardon/That Patchwork Place. Machine quilted by Cheryl Brown. Down the candy aisle, I spotted a pretty little group of pastel colors. Inside a bag of buttermints. Like these. I bought the bag and took the candies to my local quilt shop to match up candy colors with solid-colored flannels. Then I went home and ate the candies. The whole bag. It was a big one. Yes, sometimes inspiring can be fattening. But it's not often that you actually get to taste your inspiration. Opportunity seized. I wanted texture for tiny baby hands, and I love this fun swirlygig design. The swirlygigs start with big and small circles of flannel. Layers of circles give each swirlygig a great lift off the quilt, so it's incredibly dimensional. The layers also provide a little extra coziness and warmth. I know this because I have actually used this quilt. 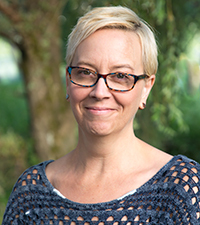 When you make a quilt for publication, it's all about keeping it pretty, keeping it wrinkle-free, keeping it clean. But now that "Buttermint Swirls" is back from her months-long trunk show, she's here to stay. She is the first of a few choice quilts that we, as a family, have decided to keep. Just this week little Charlie has started to run his fingers along the swirls as he spends some "tummy time" on the quilt each day. And if you were to test the quilt in a lab to find her rightful owner, you'd know she was his. Charlie's DNA is all over it, in the form of drool. Flannel is much more absorbent than I thought it would be. Bonus. So, not much of a story about the making of this quilt. Just the anticipation of what stories she will bring to us, now that she officially belongs to us. It'll be so much fun to hear what Charlie says about her a few decades from now. I didn't know it while I was making the quilt, but she has always belonged to Charlie. Now she's his, all HIS. You can see more quilts from the "little box" here, see a video about it here, and read more about each quilt here. Next week comes the quilt I gave away on this blog, "Elementary!" Don't miss her a bit–she went to the perfect home. Hope to see you here again next Friday. I loved this one, too! And Charlie is absolutely adorable! I really like this one,cute picture !